If all goes according to plan, there should be a new tiled bathroom floor by the time I come home tonight. We bit the bullet and decided to get the contractor to put in the floor tile too. It saves us the trouble of having to find a place to cut the marble tiles that surround the perimeter (12”x24” pieces that need to be 6”x24”) to fit the design we came up with. Only problem is that the basketweave tile we chose won’t be in stock until mid-January, so tiling guy will have to come back to fill in the middle piece. At least if the marble goes in then we can get the toilet installed! HandyMan put primer on the walls on Sunday so right now the room looks fresh, bright, and white. Over the holidays we plan to get the subway tile done on the walls and paint. We’ve got a few other things left to do…order the tub glass and curtain rod, order the door. We could have done these weeks ago but HandyMan was preoccupied with his exams and I’ve just been my lazy, pregnant self, lol. Here’s a door we can special order through Home Depot. I would have preferred a flat shaker panel style, but for that we’d have to go the custom route as I haven’t found anything readily available. 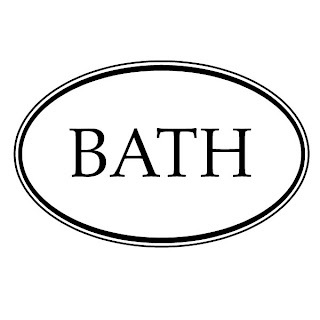 I have ordered the custom Bath decal though from etsy.com. It’s similar to the one we put on the kitchen chalkboard. Once the door is in place, lots of natural light will fill the bathroom and hopefully create a serene, spa-like feeling. Slowly, the pieces are all starting to come together!! What a wonderful idea to have a bathroom door with frosted glass. The decal would be perfect. Hm - this would be great in my home to give the hallway a little more natural light from the bathroom window. I can't wait to see your finished bathroom. Then on to the nursery! I absolutely agree with you on the glass door for the bathroom, I have been waiting to cut one of the panels out of one of my old doors and get some glass fitted in there. We're also on the same plane concerning the white kitchen. You should be very proud of your remodel, fantastic job. I came over from The Estate of Things and I am having a lot of fun reading your blog. Thanks for sharing.